Have you the talent to shine in Athy? 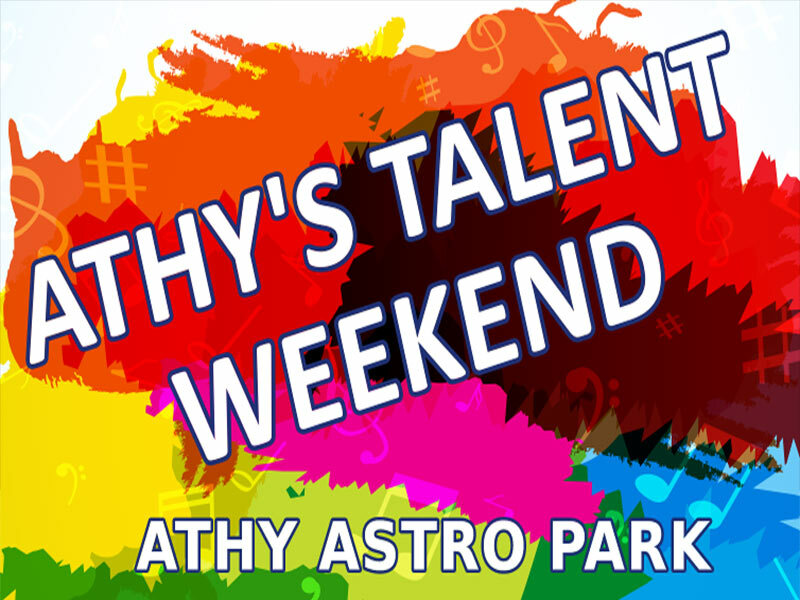 Athy Rugby Football Club proudly present the first ever ‘Athy’s Talent Weekend’ on the 5th & 6th of May 2018 at the Athy AFC Astro Park, The Showgrounds, Athy, Co. Kildare. 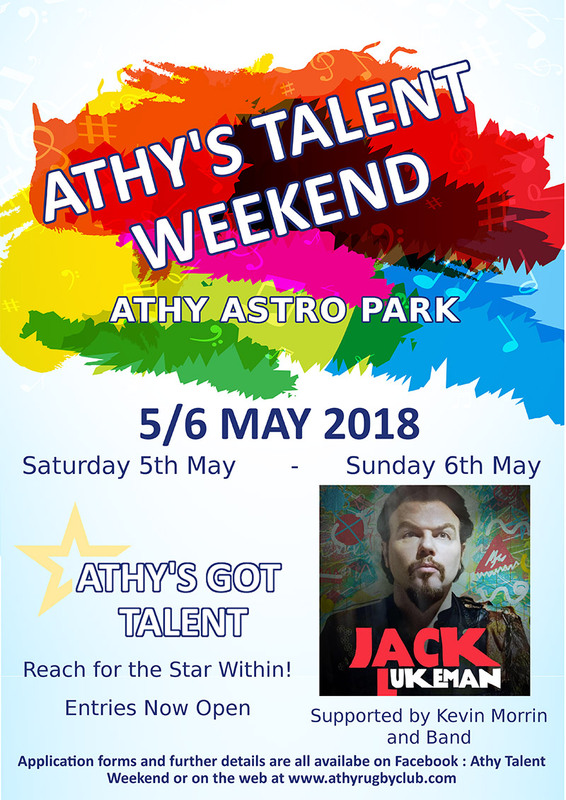 The weekend will commence on Saturday 5th May with ‘Athy’s Got Talent’, the biggest and best talent show the town has ever seen. AGT will showcase the best of local talent and is open to all acts from singing, dancing, music, acting to comedy and everything in between. Entries are invited from individuals to groups, independently or representing clubs, businesses, organisations, community groups or schools, across all spectrums. If it can be called a talent, then we have the stage. 20 individual and group acts will perform on the night in front of a live audience and a panel of guest judges. Applications are now open. Closing date for all entries is Friday 3rd March 2018. Terms & Conditions apply. Due to the large volume of applications anticipated an auditions night may be held in Athy RFC on Friday 30th March at 7.30pm. The Athy’s Talent Weekend will continue on Sunday 6th May when internationally acclaimed and local musician extraordinaire Jack L will take to the stage. The great Jack L has spent much of 2017 touring throughout Europe with such luminaries as Jools Holland, Imelda May, Neil Sedaka and Aerosmith! There’s something for every taste in Jack’s music. His most recent best selling album of original material Magic Days was deemed his “best work ever” by The Hot Press and Irish Times amongst others, and it was “Album of the Month” on RTE Radio One. It promises to a very magical night that will no doubt live long in the memory. Jack L will be supported by another exceptional local musician Kevin Morrin and his band, all of whom are again local and very talented – Brian Hughes renounced Uilleann pipes and whistle player, Vincent Crowley on keyboard and John Hosey on guitar. "This is going to be a very exciting event for the town and environs of Athy, I can assure you there will be no concealed talent on our weekend" said Aideen Treacy, head of the organising committee. "Athy has already produced some amazing talent in recent years and we are looking to showcase what else the town and its surroundings districts has to offer. It will be a super opportunity for everyone to be part of an event that will bring people together and create an air of excitement". The event is being organised by an experienced team of dedicated volunteers from Athy Rugby Football Club with support from Athy Town Council and Kildare County Council. Tickets for the Athy’s Got Talent event will be available to buy from the organising committee, participating acts, Conlans Family Centra, Dublin Road, Athy and other outlets.